Continuing the discussion about Delphi compiler and the object files. Please note, it is not a full-featured implementation of OMF specification. 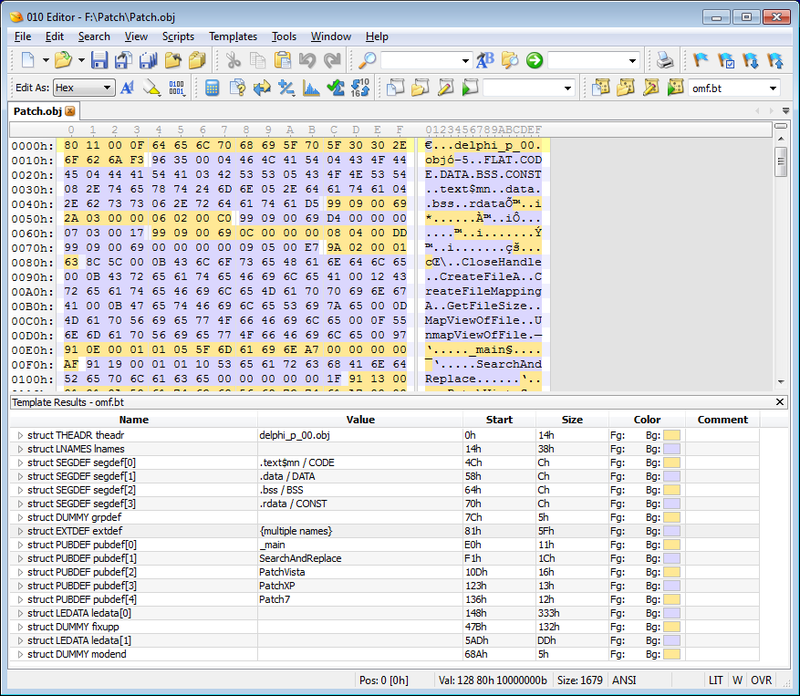 I only implemented all OMF file records that are processed by Delphi 2007 compiler. So, next time you have a cryptic compiler error while trying to link OMF file in Delphi, you can take a look into your OBJ file and make an educated guess what's causing the problem. Next possible issue is exceeding the number of EXTDEF or LNAMES records - this can happen if you're trying to convert a really large DLL file into OBJ file. Finally, your OBJ file might contain some record type which is not supported by Delphi compiler at all. I'm not aware of a simple way to fix it, I would try using 010Editor and OMF template to remove the entire record. If your problem is not caused from any of the above issues, please feel free to drop me a note - I'll be happy to look into it. This is a list of limitations I was able to compile and/or confirm. Some of them come from Embarcadero official notes and the rest I obtained by analyzing dcc32.exe. Not more than 10 segments - if number of segments exceeds 10, buffer overrun will probably happen. Segments must be 32bits. Will cause "E2215 16-Bit segment encountered in object file '%s'"
Code segments: "CODE", "CSEG", "_TEXT"
Constant data segments: "CONST", "_DATA"
Read-write data segments: "DATA", "DSEG", "_BSS"
Segment with any other name will be ignored. Not more than 50 local names in LNAMES records - will cause "E2045 Bad object file format: '%s'" error. Not more than 255 external symbols - will cause "E2045 Bad object file format: '%s'"
Certain EXTDEF records can also cause "E2068 Illegal reference to symbol '%s' in object file '%s'" and "E2045 Bad object file format: '%s'"
Can cause "E2045 Bad object file format: '%s'" and "F2084 Internal Error: %s%d"
Embarcadero says that "LEDATA and LIDATA records must be in offset order" - I am not really sure what that means. Can cause "E2045 Bad object file format: '%s'"
This type of record is unsupported, will cause immediate error "E2103 16-Bit fixup encountered in object file '%s'"
Again I'm not sure what they mean. But there are lots of checks that can cause "E2045 Bad object file format: '%s'"
Accepted by compiler, but no real checks are performed.